Have you ever been watching a baseball game, and suddenly someone in the broadcast booth will make mention of a random statistic or milestone that leaves you saying, “What? !” or “Is that real?” In a sport which relies so much on quantifiable, tangible numbers and (in recent years) advanced analytics, crazy stats appear more often than not. Keeping track of these stats is not only helpful for your overall knowledge and acumen, but they can also assist in fantasy, especially when it comes to playing matchups and making (or not making) potential waiver wire pickups. We know, it’s still very early in the season and we could forget a lot of these by June, but hey, they’ll probably be replaced by even crazier stuff. With that said, let’s run down some of the wildest stats of the week. Just as we all expected, the Seattle Mariners have the best offense in baseball (insert sarcasm here). What isn’t sarcastic, however, is that Seattle has been making history since the start of the season — specifically, with the long ball. They set an MLB record with 16 consecutive games with at least one home run. The 32 home runs they hit in their first 12 games are the most in MLB history. They hit 11 home runs this past week alone. Probably the most impressive part of this is that every single active positional player on their current depth chart has hit at least one home run this season (yes, you read that correctly). If you have an open roster spot/a position with questionable offensive production in a deep league, consider any Mariner right now. Daniel Vogelbach (62% owned), Jay Bruce (45% owned), Ryon Healy (55% owned) and Omar Narvaez (42% owned) aren’t multi-category fantasy studs, but A) they’re on this offense and B) might be available in your league. But for the purposes of this list, Khrush is the first player in 2019 to reach double-digit homers, thanks to a stretch this past week where he hit homers in three straight games — including four bombs in 24 hours. For all his incredible hitting prowess, Altuve has never been classified as a home run hitter. He’s only hit 20-or-more homers twice in his career. For fantasy purposes, we’ll take the 10-15 homers when we’re getting plus-production in every single other counting category. 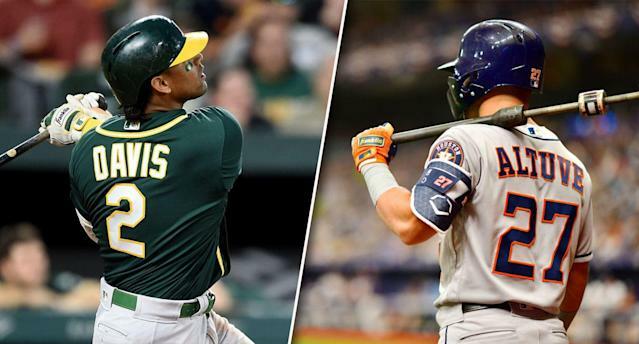 So far, however, Altuve’s fantasy owners might enjoy a career year in terms of power. Seemingly not trying to be left behind by the other home run-happy teams in his division, Altuve now has five straight games with a homer, bringing his total to seven (he hit seven home runs all season in 2014). He also had a pretty good week: 10-for-25, 10 RBI. Altuve is now tied for second in the AL in home runs with the aforementioned Jay Bruce. Talk about your pleasant surprise. This particular stat might be the most indicative of how early we are in the season. The chances of these four pitchers staying at or near the top of the ERA standings come seasons end are pretty low. Nonetheless, they deserve mention, simply because they’ve probably helped more than a few fantasy teams to early wins. Tyler Glasnow (0.53) and Matt Shoemaker (0.92) lead the AL in ERA; Joe Musgrove (0.00!!!) and Luis Castillo (0.92) lead the NL. The giant Glasnow has apparently found the home in Tampa Bay he was looking for in Pittsburgh, as he’s been mercilessly confounding opponents with his devastating curveball. Sure, a 0.53 won’t last won’t last (especially not in the AL East), but if he can stay even relatively close to his current FIP (1.97) and xFIP (2.51), he’s set up for success this season. 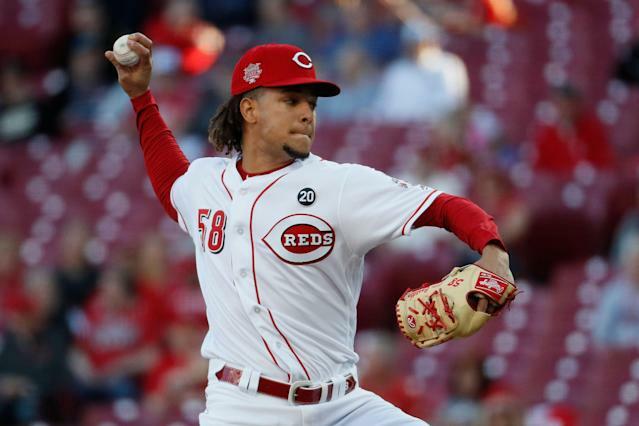 Luis Castillo has defeated his demons — at least, thus far. For his career, Castillo has allowed a .453 SLG and .768 OPS to left-handed batters, compared to a .328 SLG and .590 OPS to RHBs. This season, however, Castillo has held left-handers to a paltry .034 batting average and .234 OPS. Not to mention, he owns a pretty 11.4 K/9 ratio for the season. He’s living up to his breakout potential at 26 years old, and could be the safest season-long bet of this quartet. Matt Shoemaker’s last full season was 2016, when he pitched to a 9-13 record with a 3.88 ERA. He’s been mired in injuries the last two years, but has started 2019 on a beautiful note. Armed with a splitter that could bring tears to one’s eyes, Shoemaker dominated in his first two starts before facing his first big test of the season: the Boston Red Sox. He beat them too, allowing two earned runs (via the long ball). The main issue with Shoemaker is his sustainability. His current .159 BABIP is as unsustainable as it gets (he’s a career-.292 pitcher), not to mention his issues with arm health in seasons past. That said, he’s been excellent so far. Musgrove has been a pleasant surprise, albeit one that some saw coming. His control has always been great (career 2.1 BB/9, 8 K/9), but he’s never been able to put it all together. So far, so good. His 0.00 ERA obviously won’t last and his 3.91 career FIP portends a regression to the mean, but he’s so far allowed just seven hits in 15.1 IP. Good sign for a potential breakout season, as long as he gets the work (he’s never pitched more than 120 innings). The chances of these pitchers being unowned in your league are low, but kick the tires on Musgrove (69% owned) and Shoemaker (76% owned — up 28% from last week) on your waiver wire, just to be certain. The Kansas City Royals lead-off hitter (and arguably their best hitter, period) just ended a historic stretch, but it’s worth mentioning nonetheless. Merrifield connected with a hit in 31 straight games; the longest streak in Royals franchise history. Unfortunately, the streak ended in ugly fashion. In Kansas City’s 7-6 extra-innings loss to the Mariners, Merrifield blanked in six at bats with two strikeouts. But fantasy owners don’t care, because for the season Merrifield is batting .339 with just six strikeouts in 65 plate appearances. The streak may be over, but Merrifield will continue to be an elite fantasy option. Forgive the “Game Of Thrones” mention (not really). I included Davis on this list last week, albeit for a less-exciting reason. Davis carried a historic 0-for-54 stretch into April 13’s game against the Boston Red Sox. Just to give you an idea of how bad it had gotten, the Orioles put 12 runs on the board vs. the A’s on April 8. Davis went 0-for-5 with two Ks in that game. But that all came to an end on Saturday. At long last, Davis broke free with an RBI single against Rick Porcello. He went on to go 3-for-5 with four RBI in the game. It was a great moment that went beyond sports, and it was good to see Davis produce. Now, this isn’t to say he’s suddenly back on the fantasy radar; he still plays for a terrible team and has been a shadow of his home run-hitting self. But, the streak is indeed over, and that’s worth mention. Byron Buxton/Jorge Polanco: Wonder Twins? Along with Miguel Sano, the Twins have long been waiting for Byron Buxton and Jorge Polanco to reach their potentials. Well, if the first couple of weeks are any indication, this might be the year. Buxton (.300/.364/.533) and Polanco (.372/.417/.721) have been hitting more than they’ve been striking out, and they’ve helped the Twins to the top of the AL Central. The power-speed combination that both hitters possess is the primary reason they’re so enticing, but they’ve never been able to live up to the hype thus far. That said, Polanco has shown a positive hard-hit percentage this season (47.2), and Buxton has three stolen bases on the season, showing a willingness to run. Injuries have been the biggest detriments to the potential of Buxton and Polanco (Polanco is also coming off a PED suspension in early 2018), but there are worse options out there. Savvy fantasy owners definitely don’t expect this production to last, but they’re still worth a look (Buxton might be hard to get at 64% owned, but Polanco rests at just 29% owned). It seems like the Rays have so far won the Chris Archer trade — by a wide margin. We already talked about Glasnow, but man, has Austin Meadows been on a rampage this past week. The 23 year old slugger delivered an excellent fantasy week: 12-for-22, 12 RBI, 4 HR, 1 SB. His current batting line is majestic: .385/.467/.788. Upon closer inspection, Meadows could be on the verge of a solid fantasy season, his first ever considering the injuries that have hindered his major league career thus far. He owns a whopping 53.8 hard-hit percentage so far, evidenced by his six home runs. He also has two stolen bases to go along with it. Fantasy owners will probably have to deal with a poor K:BB ratio and a regression to the mean in terms of BABIP (currently a wondrous .424) as Meadows matures, but the power-speed combo is as intriguing as it gets, and the high average so far is a good sign too. Which wild stats stood out to you this week?